Here are three that I would not part with no matter what year it is or how old they they are. So instead of giving them away, I want to encourage you to add them to your library or go to the library and check them out. 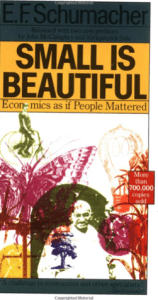 Small Is Beautiful: Economics as if People Mattered by E. F. Schumacher was originally published in 1989 but is based on a 1959 series of London University Lectures. He promoted sustainability and green before they were popular. It is uplifting to read. A client, Sharon Sarles, asked me if I had read this because she thought she heard me voice many of Schumacher’s ideas. I had not. But once I had, I never wanted to let this book and its vision disappear. I was honored that she thought that I had read it. Now I try to tell everyone who will listen about him and this book. Small truly is beautiful and it inspires me to focus on small businesses and their owners who truly care about their business, their families, their community and the world. If you want to be involved or learn more, there is an E.F. Schumacher Society which is located in Great Barrington, Massachusetts. 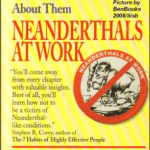 Neanderthals at Work: How People and Politics Can Drive You Crazy…and What You Can Do About Them by Albert Bernstein & Sydney Craft Rozen, 1992. They have some great ideas on how to keep sane when people and politics drive you crazy. Bernstein, a clinical psychologist, has a website and still explores “Neanderthals” and other creatures. No offense to all the Myers-Briggs and personality test stuff out there, I just like this better. It’s fun, witty, and very different as you would imagine from the title. Other people may find it too simple. This book helped me look at my past and current customers – not just employees. It helped me understand me. I am a Believer – as are most small business owners who are active in their business. It helped me help other owners because the traits they discuss, once you know them, are easy to spot. BTW, it is good to match what kind of Neanderthal you are to who you sell to and who you hire. I find hiring a “Competitor” or having one as a client is usually not a terrific idea. I do admit, as someone with the same business partner for 27 years, I have often wondered what happened to Rozen, the co-author. Looks like she has gone on to write some interesting books for families. Big-Box Swindle: The True Cost of Mega-Retailers and the Fight for America’s Independent Businesses by Stacy Mitchell, 2006, shows why we should try to keep every community weird. Mitchell is the inspiration for many Big Box Ordinances around the country including Austin’s which took TWO YEARS to get through City Council and almost did not make it. She came and spoke here a few years ago at an event sponsored by Austin Independent Business Alliance. She is terrific in person and in print. Her research in Big Box Swindle on the impact on communities when mega stores move in is eye-opening, jaw-dropping and blood-boiling. She tells it like it is: the good, the bad, and the exceedingly ugly. For small businesses who try to sell to these companies like WalMart, the results can be devastating. For small businesses in the shadow of them location-wise, with some exceptions, it does not mean better sales or even more sales. It usually means a slow death. She has a great website full of ideas of what to do when faced with this and a terrific newsletter to keep us all connected. There is a story behind this book. I bought it from BookPeople, our independently owned bookstore in Austin. It was signed and autographed by Ms. Mitchell. I was proud to have it. As the Business Liaison Chair for Responsible Growth for Northcross, I carried this book everywhere. When I went to speak on behalf of the Big Box Ordinance in Austin, I carried it. Our goal was to get Council and citizens to see that a huge Walmart Supercenter store placed on neighborhood streets, across from a school, was not good for community development or retention. We lost in court but WalMart did decide to scale back to only 90K feet from about 200K sq feet. We will have to live with it but thanks to Mitchell we knew how to fight and not lie back and take it and how to protect our neighborhood and our businesses. We also know now what to watch for as the project goes forward and we have a strong network. Most importantly, I think, it brought five neighborhoods together with the area businesses and it pushed us to request the creation of the Northcross IBIZ (Independent Business Investment Zone). The tragedy for me is that somewhere along the line, someone picked up my book. I only hope they find it as inspiring as I did. Hopefully, I will get another copy and maybe Ms. Mitchell will sign it. More of my book recommendations are located in the “Worth Reading” widget on my blog. I update it periodically when I am inspired. Do you have a book I should add? What “oldie goldies” are on your shelf? Have you told someone else about why they matter at least to you? Pass on the wisdom. We need all we can get. Be sure to watch my Tweets for date and time of when I am freecycling some of my business library. I just hope they will inspire you and you will give them a good home until you pass them along. Well, having spent too much of my professional life being driven crazy by co-workers, I’m definitely going to find the Neathderthals book! In fact, for some reason this morning I was thinking of a job, and co-worker who made life incredibly difficult, — and it’s a job I left more than 20 years ago. Yikes. I’ve been looking over NEW books. For those who want to know not how to sell a business, but how to create a business that will sell (and there’s a big difference), take a look at “Built to Sell,” by John Warrilow. He tried to sell a business once, and failed, so has now changed his ways. He said he learned more from his mistakes, than anything he did right (and I do find that very important). There’s even a quiz on sellability (or sellability index) that helps you find out if you have a sellable business and how much money you might get for it.